To say that Bonnie Lysyk has a tough job is an understatement. Ms. Lysyk’s office, which is an independent office of the Legislative Assembly of Ontario, conducts financial audits of the provincial government, organizations, agencies, and programs that are provincially funded. As interns, we’re still getting used to running our nine committees! Before her appointment as the Auditor General of Ontario, Ms. Lysyk served in senior positions in the public and private sectors in the provinces of Manitoba and Saskatchewan for over 25 years. As OLIP interns, we have the privilege of meeting all the independent officers of the Assembly, and were very excited to get a chance to speak with Ms. Lysyk. We were also joined by Vanessa Dupuis, Strategic and Operations Advisor to the Auditor General and a former OLIP intern, as well as Nick Stavropoulos,Assistant Auditor General and Emanuel Tsikritsis, Audit Team Director. Ms. Lysyk spoke with us about the role of the Auditor General’s office and her staff’s work on public accounts, value-for-money audits and special audit reports. We were surprised to learn that each year the office selects a few entities to review and undertakes thorough, year-long audits. The backgrounds of the staff at the Auditor General’s office are as diverse as the types of issues the office works on, supplemented by a group of public and private sector experts. We also discussed the Auditor General’s thoughts on expanding the office’s mandate. Ms. Lysyk spoke about the challenges that private-public partnerships and programs/services that cross provincial-municipal jurisdictions present to her office’s work. We were also happy to hear about the trends that Ms. Lysyk has seen throughout her time as an independent office of the legislature and the impact of government change on her office’s work. Thank you for taking the time to share your experiences with us, Ms. Lysyk! Your perspectives on the use of public funds and efficiency of government programs will stay with us as we continue to learn more about the interplay between the legislative and executive branches. As part of their orientation to Queen’s Park, the OLIP interns were fortunate enough to meet with Todd Decker, Clerk of the Legislative Assembly. The interns were able to draw on Mr. Decker’s thirty-four years of experience at the legislature and enjoy a wide-ranging discussion on the nuances of his role and the changes at Queen’s Park during his tenure. The interns learned about how Question Period, time allocation, and the work of standing committees have changed over time. Of particular note was the change in Standing Orders and legislation such as the Executive Council Act. Like cohorts before them, the interns were also fascinated by the now rarely used Committee of the Whole House. Mr. Decker contrasted the role of committees in provincial legislatures across Canada as well as the federal legislature. The Clerk’s perspective on the procedures and dynamics in Westminster-style legislatures around the world proved extremely interesting. A recurring theme of interest throughout the orientation period is the interplay between nonpartisan and partisan actors within the legislature. As Clerk, Mr. Decker is both the procedural expert for the legislature as well as the Secretary of the Board of Internal Economy. Learning about the evolution, composition, and mandate of the Board allowed the interns to better understand the day-to-day functioning of the legislature. The interns have enjoyed all of their meetings with nonpartisan staff. Understanding the behind-the-scenes work and processes that allow the legislature to run smoothly has proved an invaluable learning experience and will provide dividends for the interns as they begin their placements with MPPs. Thank you, Mr. Decker for making time for us, answering our many questions, and offering your knowledge of the legislature. This past Thursday, the interns gained valuable insight on the role(s) of the Ontario Information and Privacy Commissioner, Brian Beamish and the Assistant Commissioner David Goodies. Established in 1988, the IPC oversees the Freedom of Information and Protection of Privacy Act (FIPPA), the Municipal Freedom of Information and Protection of Privacy Act (MFIPPA) and the Personal Health Information Protection Act (PHIPA). We learned that the Information and Privacy Commission plays a fundamental role of ensuring these Acts are effective with government and the public. FIPPA applies to provincial ministries, most provincial agencies, boards and commissions, as well as to universities and colleges, while MFIPPA covers municipal institutions such as municipalities, police, library, health and school boards, and transit commissions. We also learned that PHIPA regulates the collection, use and disclosure of personal health information within Ontario’s health-care system. Together, these three Acts establish the rules for how Ontario’s public institutions and health care providers may collect, use, and disclose personal information. Furthermore, the Acts provide the public with a right of access to information. How does the IPC manage to ensure all of this runs smoothly? The role of a Commissioner is fascinating, given that the Commissioner is an Officer of the Legislature, who is appointed by and reports to the Legislative Assembly of Ontario, and is independent of the government of the day. Both the Commissioner and Assistant Commissioner shared the significance of liaising and collaborating with the public and private sector to raise awareness about privacy-invasive communications as well as data processing technologies. They also discussed the role that information technology plays in collecting and storing data in Ontario. According to the Commissioner, “times are changing and we have to change with it”. Thank you to the Commissioner and Assistant Commissioner for taking the time to meet with us, and for sharing their expertise on privacy and information issues. We are certainly inspired by the way in which you regain Ontario’s position as the leader in Canadian privacy and information protection! Hannah Forsyth. : Don’t make politics personal, never forget the person in politics. Sara Gajic: Appreciating politics for and in spite of all its complexities. Hannah Iles. Discovered ways to make Ontario a better place for everyone. Jacob Larocque-Graham: Lived my best non-partisan life alongside great friends and colleagues. Stephanie Lowe: Broadening knowledge, broadening horizons and most of all broadening friendships! Leslie Muñoz: Work-integrated learning at its finest – an experience unlike any other! Rachel Nauta: Left stuck between running for, or away from, political office. Alex Overton: Ran out of Cards to build my House with, bye. Kyle Sholes: Unpredictable challenges with extraordinary results. The experience of a lifetime. Emily Trudeau: Learned about my home, myself, and the mechanisms of government. Farewell from the 2016-2017 OLIP interns! 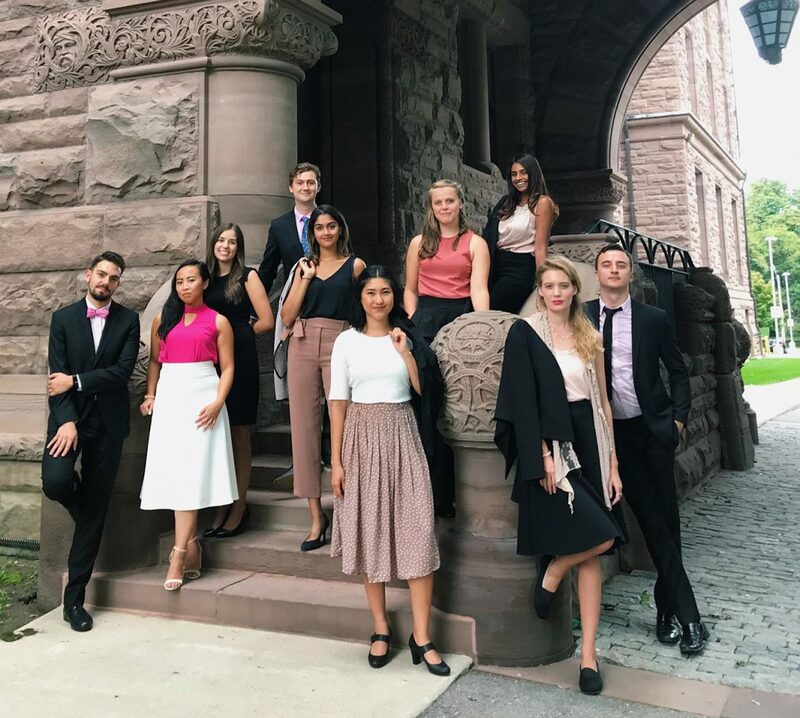 We want to thank everyone who took the time to meet with us both in and outside of the Ontario Legislative Assembly and to everyone who supported us throughout our year in the Pink Palace. Make sure to watch the hallways of Queen’s Park this week for the new group of interns. We wish them all the best in their fabulous year ahead!